Bone density decreases can occur as women age, and in response to other medical and biological events. Loss of bone density may indicate osteoporosis and an increase in fracture risk. Thompson offers hip, spine, forearm or full-body bone densitometry with state-of-the-art technology and certified technologists. We offer an appointment schedule which allows women to schedule both their mammogram and bone density study on the same visit for maximum convenience to the patient. Breast ultrasound can provide accurate images of breast nodules to differentiate their cystic and solid structures. Breast Ultrasound is used to assess breast lumps to identify solid and cystic components. Ultrasound is often used as an adjunct to mammography to more fully evaluate dense glandular and cystic breast tissue. Ultrasound can also be used to identify a specific breast mass for biopsy if indicated. Core biopsy is a minimally invasive procedure which frequently eliminates the need for a surgical biopsy. Thompson was the first area facility to offer stereotactic guided core biopsies in 1993. Using state of the art technology, we now offer stereotactic or ultrasound guidance for vacuum assisted needle biopsy. This simple outpatient biopsy requires only a local anesthetic. There is virtually no scarring or patient discomfort, women can return to their usual activities the next day, and the cost is about half that of a surgical biopsy. Aspiration of a breast cyst is a minimally invasive diagnostic procedure for some women who present with a breast mass. Using ultrasound guidance and local anesthetic, a small needle is used to remove fluid from the cyst. This fluid can be sent for cytology if further evaluation is required. Breast examinations include a mammogram, breast health counseling and a breast health exam performed by a nurse. No physician referral is needed for an annual screening mammogram, and the procedure is covered by virtually all insurance companies. For more information or to schedule an appointment, call (865) 331-1624. Thompson’s multidisciplinary breast and chest clinics bring together medical oncologists, radiation oncologists, surgeons, radiologists, pathologists. licensed clinical social workers, nutritionists, genetics counselors and clinical trial nurses to review each patient’s case. Each clinic is coordinated by a patient navigator, who is an oncology-certified nurse and serves as your advocate throughout your diagnosis treatment process. During clinic, diagnosis is confirmed and the patients are seen by the team of cancer specialists to discuss treatment choices. For additional information about the multidisciplinary breast and chest clinics, please click here, and call (865) 331-2797 or 1-800-559-5583 to speak with our multidisciplinary coordinator. A PET scan reveals changes in the body’s metabolism, so it can find cancer before it has grown enough to be detected by other types of scans. PET can determine if a tumor is malignant or benign, and the stage of lung, colorectal, head and neck and breast cancer, lymphoma, melanoma and many other cancers. Frequently a PET scan can eliminate the need for a biopsy or other diagnostic surgery. A single whole-body PET scan can reveal the original site or sites of the cancer and any places to which it has spread. In 2001, Thompson Cancer Survival Center West was the first facility in the region – and just the second in the world – with the LSO PET scanner. Next, Thompson pioneered a new generation of PET-CT scanner that can find tumors faster and more accurately. The Biograph TruePoint PET CT cuts scan times by as much as 50% and has a higher resolution, so doctors can identify tumors which might go undeteced with other technologies. In fact, it can find tumors and metastases at the molecular level, long before they would become visible with other systems. Thompson’s Downtown PET Imaging Center, which is a department of Fort Sanders Regional Medical Center, is currently utilizing the latest in leading-edge PET technology: the Biograph 40 TruePoint PET CT scanner. This technology combines the accuracy of the TruePoint system with a 40-slice CT scanner to pinpoint the locations of abnormalities more precisely than ever before. 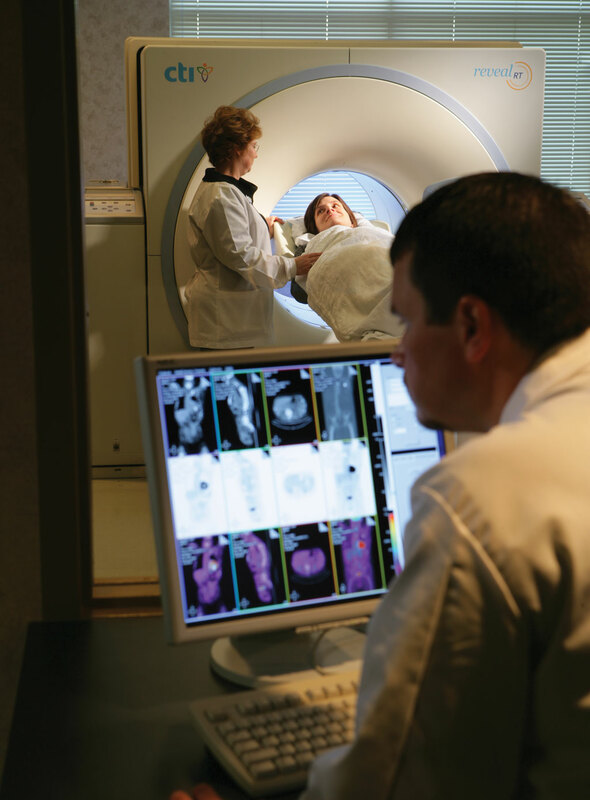 Both of Thompson’s PET Imaging Centers at West and Downtown are accredited in positron emission tomography by the American College of Radiology (ACR). This accreditation assures patients that their treatment meets the most rigid standards of excellence mandated by the ACR. Thompson Comprehensive Breast Center, a department of Fort Sanders Regional Medical Center is only one of a select few breast centers in Tennessee to be awarded a Breast Imaging Center of Excellence by the American College of Radiology (ACR). Thompson’s certified technologists perform more than 13,000 mammograms each year using the latest in digital technology. The Chief Radiologist is the only fellowship-trained breast health specialist in East Tennessee, and the Breast Center team includes a nurse breast health specialist, a mammography certified technologist and specially-trained auxiliary staff. Please click here for more information about PET services. Thompson Cancer Survival Center’s Cancer Outreach staff travels to underserved areas to provide free or low-cost services to people who are medically needy or underserved. The Mammography Voucher Program offers low-cost screening mammograms to women in the communities where they live and work. Mammograms are provided at no cost to the financially eligible. Prostate and cervical cancer screenings are provided for free in collaboration with several rural health clinics throughout East Tennessee. Cancer Outreach Services collaborates with local businesses and community organizations to provide education about cancer detection and prevention to medically underserved, high-risk communities. Each year, thousands of people receive potentially life-saving services from Thompson’s Cancer Outreach Services. Learn more about Outreach Services here.